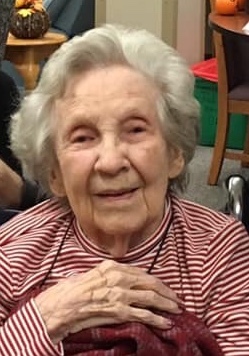 Bernice A. Burton, 103, of Princeton, Indiana passed away on Saturday, March 30, 2019 at Gibson General Hospital in Princeton. She was born February 16, 1916 to the late Cecil & Iva (Bailes) Aishe of Odon, IN. She married Wayne Burton on September 22, 1934. They lived in Anderson, In before moving to Princeton, in the early 1950’s. They were married for 63 years before his passing in 1997. Wayne and Bernice were avid antique collectors and active in the old car hobby. Bernice is survived by her children Ann Bubar of Effort, PA, Gary Burton of Ft.Lauderdale, FL and Phil Burton of Los Gatos, CA; six grandchildren and eight great-grandchildren. A private family service will be held at a later date. Colvin Funeral Home is honored to serve the Burton family. The family would like to express their deepest gratitude to the nurses and staff of the Skilled Nursing Facility at Gibson General Hospital for their exceptional care and support given to Bernice over the many years. You may leave a message of sympathy or light a candle in memory of Bernice at www.colvinfuneralhome.com.